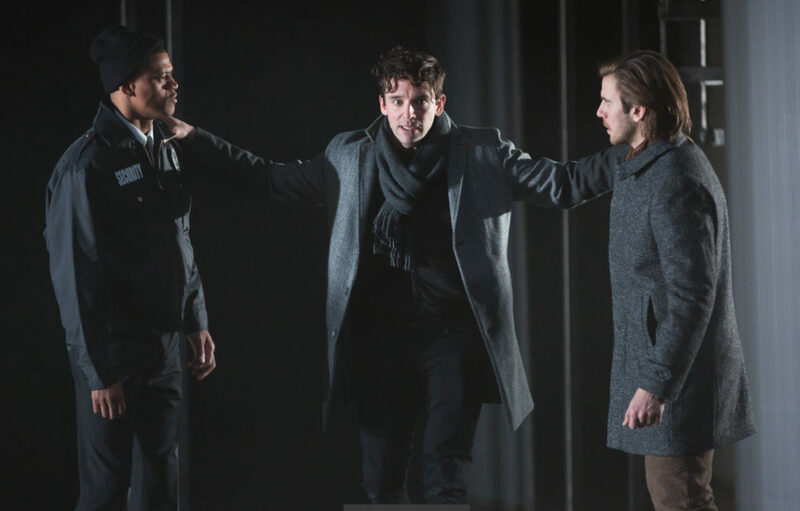 Avery Glymph as Marcellus, Michael Urie as Hamlet and Federico Rodriguez as Horatio in Hamlet ~ Photo by Scott Suchman. 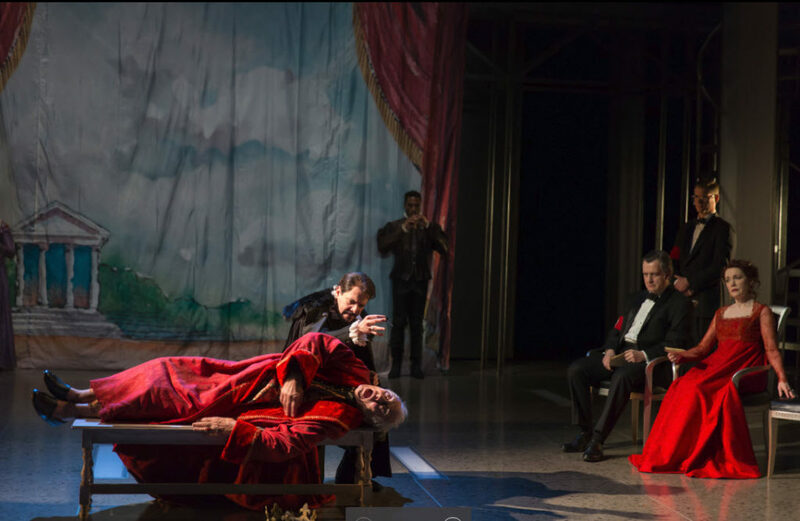 Michael Kahn’s swan song in his final season as Artistic Director at the Shakespeare Theatre Company will prove to be a lasting memory of his herculean efforts to bring Shakespeare to modern audiences. In a breath-of-fresh-air he has cast Michael Urie, a former student of his, to portray Hamlet. Urie gives a pin-drop performance that enraptured the opening night audience. His is a matter-of-fact Hamlet who is hip to the machinations of his enemies and tormented by his limited options – suicide or murder. Perhaps both. His delivery of the classic lines, is conversational, visceral and physical. Even in this longest of Shakespeare’s plays, the three-hour production zipped by thanks to Urie’s electrifying performance and sense of comic timing. Kahn switches up the sequence of Hamlet’s melancholy soliloquy from Act One Scene Two, “O, that this too too solid flesh would melt.” to serve as Hamlet’s prologue and introduce us to his wretched state of mind. This unique artistic decision explains Hamlet’s suicidal state of mind and sets the scene for his descent into madness. Remember, Shakespeare wrote three versions of this play and thus none are etched in stone. Ryan Spahn as Rosencrantz and Kelsey Rainwater as Guildenstern in Hamlet ~ Photo by Scott Suchman. Kahn imagines the Kingdom of Denmark as the headquarters of a major corporation and the domain of King Claudius (Alan Cox from Translations on Broadway) who is CEO of all Machiavellian PSYOPs. Right from the start Scenic Designer John Coyne puts us at the metal desks of modern day uniformed security guards. On a large bank of CCTV screens broadcasting ordinary images of the building’s access, Horatio (Federico Rodriguez), Bernardo (Chris Genebach) and Francisco (Brayden Simpson) are stunned to see an apparition. 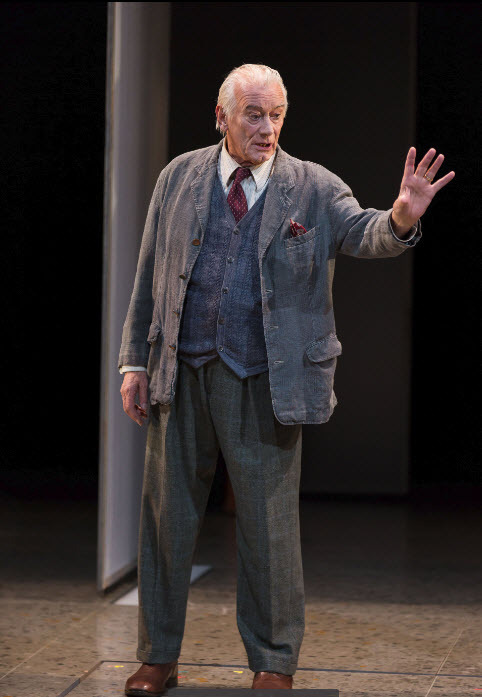 Keith Baxter as Player King in Hamlet ~ Photo by Scott Suchman. It is the ghost of Hamlet’s father (Keith Baxter) revealed to them as a fuzzy image. In Kahn’s version, suits, security guards and cell phones place us firmly in the world of high tech. Even Hamlet and Ophelia (Oyin Oladejo from Star Trek: Discovery) profess their love and seal their break up through texts. And Coyne reflects this cold, grey, desolate sense of place with steel beams, contemporary furnishings and spiral stairways leading to a vast catwalk. 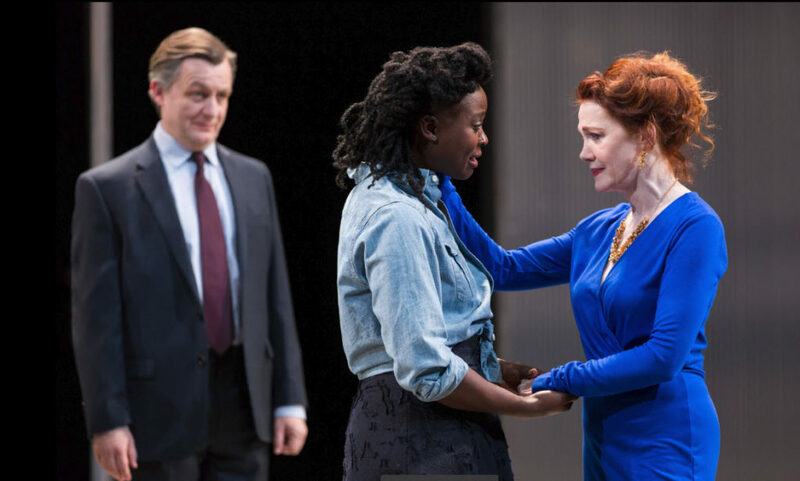 Alan Cox as Claudius, Oyin Oladejo as Ophelia and Madeleine Potter as Gertrude in Hamlet ~ Photo by Scott Suchman. 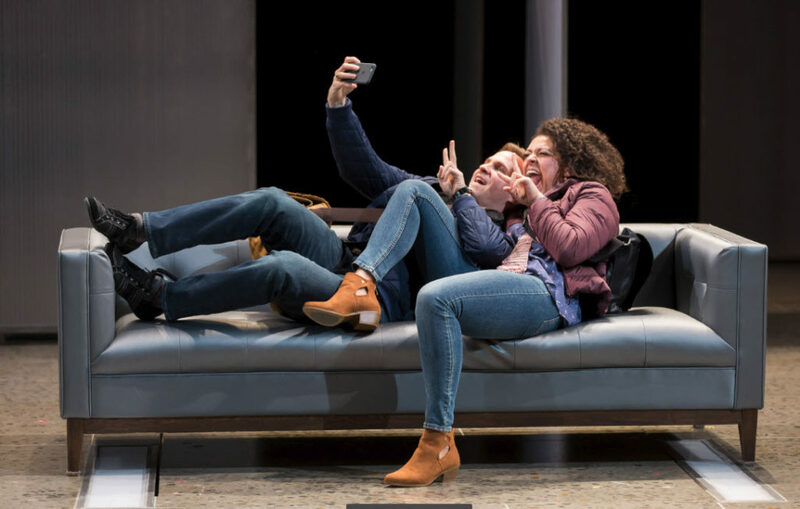 Corporate spies abound – Rosenkrantz (Ryan Spahn) and Guildenstern (Kelsey Rainwater) report to Queen Gertrude (Madeleine Potter from An Ideal Husband on Broadway) on Hamlet’s mental state, as does Polonius (the enjoyably duplicitous Robert Joy) who, as you know, has his own agenda, and his son Laertes (Paul Cooper) too – and Hamlet doesn’t get banished to England until the end of Act One. Yet all the pieces fall into place seamlessly. I can’t say enough about the relevance and riveting modern dynamic of this production – the power and destruction of authoritarianism, its secrets, lies and power struggles – and why, given the current state of our government, we would be wise to listen and take heed. At the Shakespeare Theatre Company’s Sidney Harman Hall through March 4th at 610 F Street, NW, Washington, DC 20004. For tickets and information call 202 547-1122 or visit online.